Caption slip reads: "Photographer: Wesselmann. Date: 1953-09-13. Reporter: Alone. Assignment: Man burned to death in fire at 351 North Avenue 57. 41: Neighbors and passers-by watch Merle Woolcot body as it is consumed by flames that burned house to the ground. 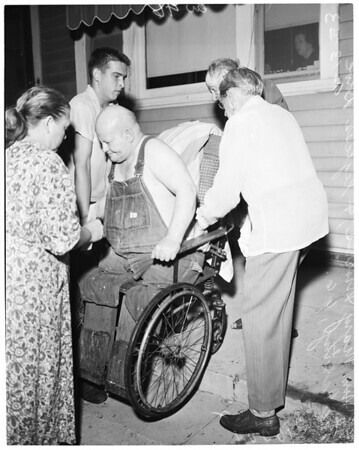 44: Neighbors rescue legless Dave McCarthy, 66, and lift him to porch of house next door to fire. 45: Neighbors rescue legless Dave McCarthy, 66, from flames that killed Merle Woolcot, 73. Mrs. Mary Morris, left, operates rest home where fire occurred."